EMPTY CAN: Anchor the band under the front foot have a slight scissor stance. Thumbs pointing down and hands slightly in front of your body. Raise hands up pulling shoulder blades down. INTERNAL ROTATION: Anchor the band to the door knob. Stand with side toward anchor,elbow at your side, bent to 90 degrees, thumbs pointing up. Pull arm toward your body, keeping elbow bent and close to your side. EXTERNAL ROTATION: Hold one end of the band in each hand, elbows at your side bent to 90 degrees, and thumbs pointing up. Pull hands away from each other, keeping elbows bent and tucked to your side. 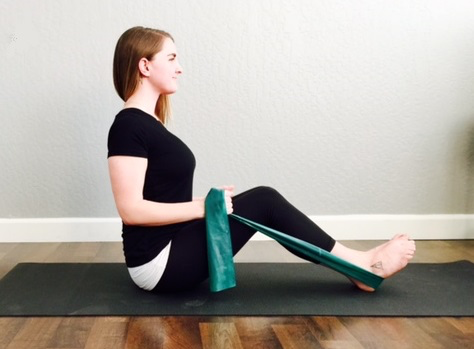 SHOULDER BLADE PINCH: Sit with legs out and band around bottoms of feet. 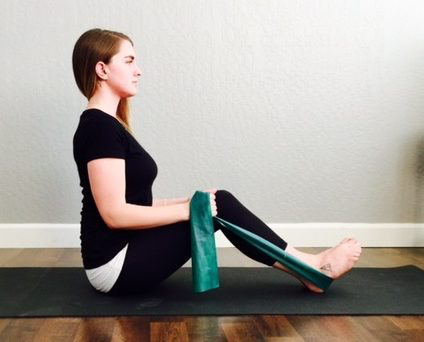 Elbows at your side, bent to 90 degrees, pinch shoulder blades together.